Last week we checked out ZiMAD’s new card collecting title Star Crusade, a sci-fi themed card game where players can play as six different factions in a pretty traditional style. 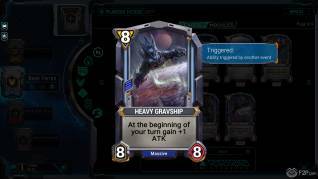 Just going into open beta, we put a few hours into the game to check out what was on offer and how it differed (or didn’t) from other card games. 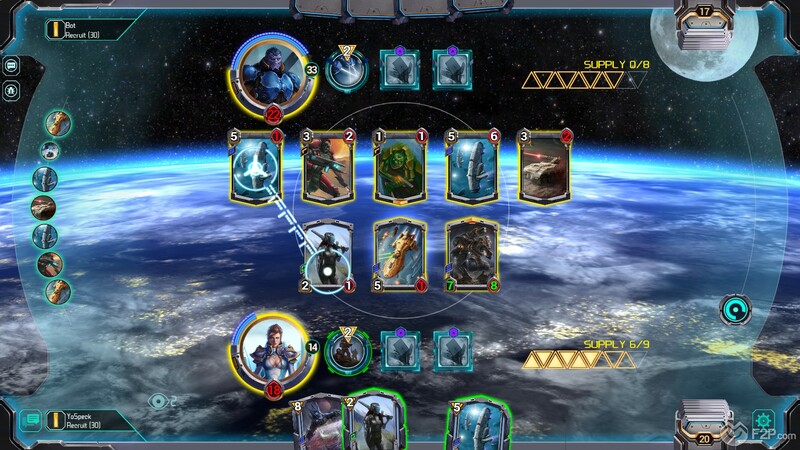 The game is very traditional when it comes to the general mechanics and gameplay; players spend resources to play cards from their pre-assembled deck, the usual Unit cards that are placed onto the battlefield or Tactics cards that have single use effects such as dealing damage, healing your units, and a bunch of other stuff that pretty much take on the role of “Spells” in other CCGs/TCGs that have a fantasy nature. 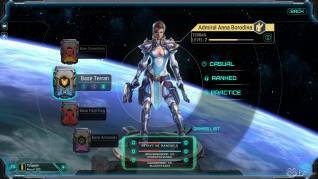 That is the first noticeable thing about Star Crusade in that it is a step away from the normal fantasy and instead is all about aliens, cyborgs, spaceships and future-tech, this is probably a good thing because when playing the game our initial gut feeling was “this plays a lot like Hearthstone”. Now this isn’t to say that Hearthstone is the most unique CCG out there, or that it necessarily burst through the ceiling of innovation, many features are staples to the card game genre and it is the little tweaks that will separate each of them individually from the masses. 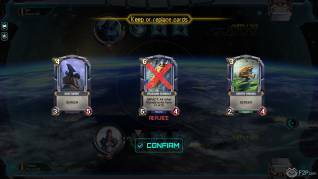 Like Hearthstone you get one extra resource each turn, a maximum of ten resources in total, so as the game progresses then inevitably the battlefield starts to fill with tons of units being dropped at once or the big hitter high cost cards coming into play. 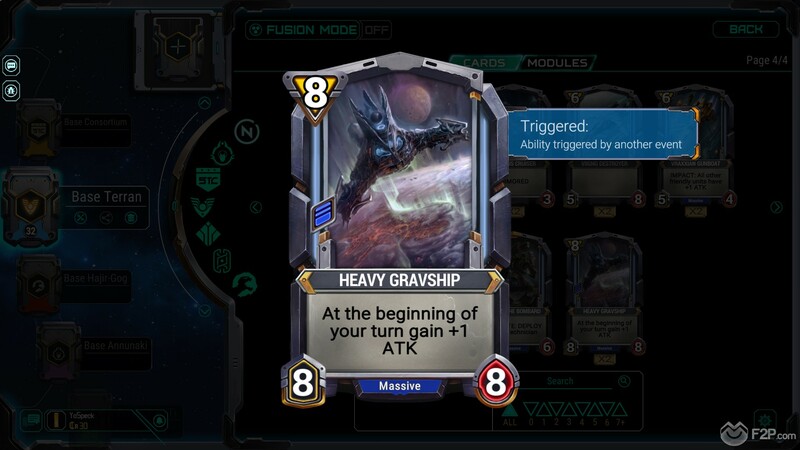 You also have a secondary Energy resource that builds up over the course of the game; this can be spent by specific cards to give you some extra functionality. One such card is the Sniper unit which is able to do an instant one damage to any target when it enters the battlefield, it also has an Energy cost of six to return it back to your hand; when placing the card you get to choose whether to just go for the normal one hit and put it on the field, or use it more like a Tactics card with an energy cost to keep it in your hand. It might not seem like much but in a game we played the enemy had a card of some fashion that dropped five 0 damage / 1 health units onto the battlefield that had the Screen trait (same as Hearthstone’s “Taunt”) where you can’t attack any other unit or the enemy Commander until they are dead. With our Sniper and a lot of energy built up we managed to spend 30 Energy one after the other and take out all the Screen units at the beginning of our turn and then decimate the opponent who probably thought he’d gotten the upper hand. Attacking the enemy Commander, as ever, is the name of the game and reducing them to zero hitpoints is how you win the battle. An interesting feature is how the number of cards in your deck, from as few as 25 to as many as 40, are directly proportionate to the number of hitpoints your Commander has in a battle. Whilst having more cards and thereby having more hitpoints might seem the preferred tactic, the reality is that with more cards there is more uncertainty as to what cards you are likely to draw each turn, whereas fewer cards might mean less hitpoints, this is offset by not only having a more guaranteed strategy (very good for rush decks) but also the fewer the cards in your deck that you have the more you are given in your initial starting hand. Modules are another unique-ish element, the ability to choose your Commanders’ ability, which costs 2 resources for each use in a battle, and differs depending on the faction; not only can players choose their Commander ability, but they can actually have 3 active at any one time in a game giving them a LOT of consistent tactical options. In one of our casual games we went up against a player who already had three modules active (we, and pretty much everyone else we played only had one) and it was an absolutely one sided fight where he could constantly heal his units and nerf ours; either this person had been extremely lucky with their booster packs, they’d played a lot and were nowhere near our MMR, or they’d spent a bit of cash to open more packs. The traits of some cards in the game, as expected, are very familiar and there’s not that much out of the ordinary that we haven’t seen in other titles. 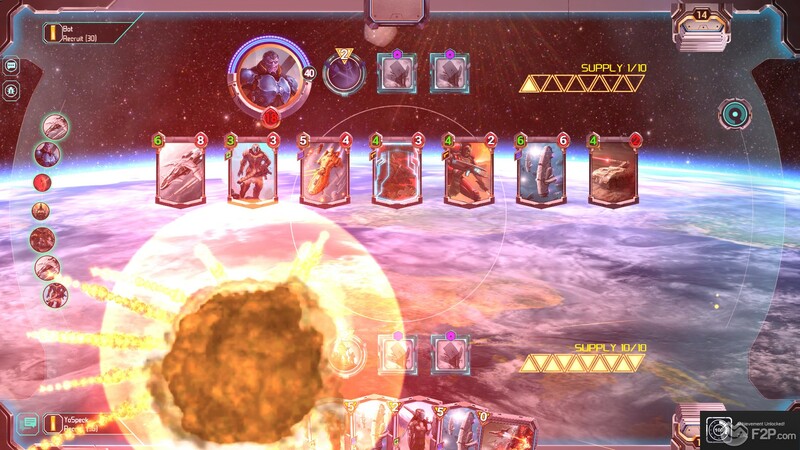 For game modes we stuck mostly to the Casual and Ranked, the third mode opened up to us was Raid, essentially the draft mode for the game where we had to build a deck from scratch and must choose the cards we want one at a time from a choice of three random cards. 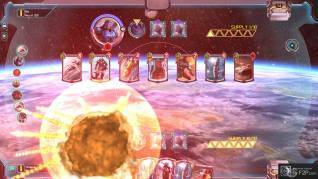 Once your deck is made, you then go into a star map and try to battle your way across the stars conquering planets that grow in difficulty, but offer greater rewards the further you get. 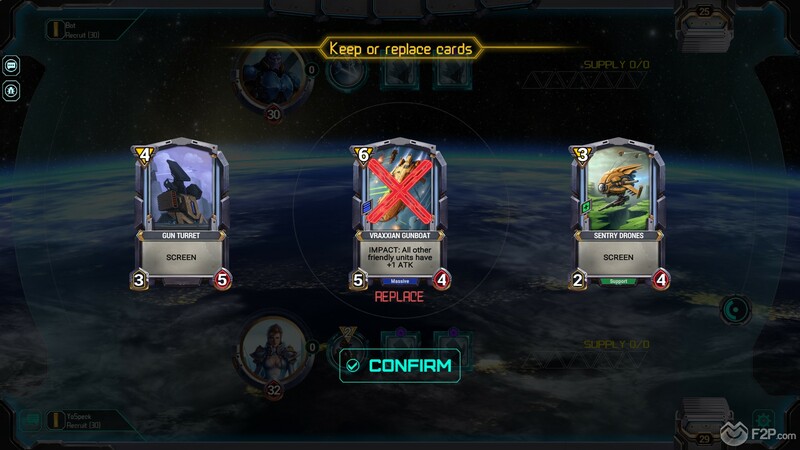 After your initial free trial it is 100 credits to play a raid match, the same cost as opening a booster pack (both of which can also be replaced by spending real cash), and so for those players who don’t have lots of cards then it’s definitely not a feature they won’t spend too much time in until they’ve a healthy pile of cards. Overall we had a nice experience with the game, the graphics are fun and fitting for the theme, little animations and explosions when units are destroyed adding to the battles. 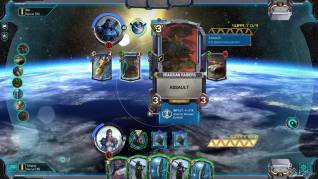 The game definitely feels like Hearthstone at its core and the casual game format we believe definitely inspired Star Crusade to go the same way, however, with the additions and twists that have been added we dare say that this adds an unprecedented level of strategy and choice when building up your deck. As the game is in open early access and free to play we’d definitely recommend anyone to go and try it, a very fun game that (so far) doesn’t seem to have much in the way of negative aspects.